World War I, for whatever reason, produced a huge upturn in Bologna’s fortunes. The Rossoblu hadn’t even come close to winning an Italian Championship before Italy’s war involvement forced calcio’s suspension in 1916. When the league resumed in 1919, however, Bologna were instant contenders. They reached their first two (losing) finals in 1921 and 1924, and won their first championship in 1925. World War II didn’t produce the same improvement. Bologna had finished seventh and sixth in the two season’s leading up to Serie A’s suspension in 1943 and never finished higher than fourth in the decade following the league’s 1946 revival. 1949-50 was particularly grim. Bologna struggled without the previous era’s now-retired stars and flirted with relegation all season. In the end they finished 15th, surviving by just three points. Things got even hairier in 1951-52, and the Rossoblu needed a last-day 4-2 over Como to avoid dropping into Serie B for the first time in history. Things improved, and Bologna finished fourth in 1955. The following season saw the emergence of a man who’d soon become synonymous with Bologna FC, Ezio Pascutti. The talented winger scored 11 goals from 18 games to help the Rossoblu to a fifth-place finish in his debut season (1955-56). Pascutti is as well-known his fiery temperament as his ability and famously punched a USSR full-back during a 1963 international friendly. Still, 296 games and 130 goals in 15 seasons make this one-club man a Bologna legend. 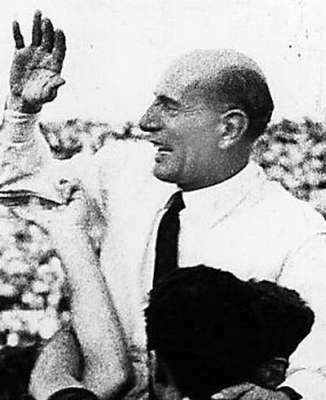 Fulvio Bernardini, who’d previously coached Fiorentina to the 1955-56 Scudetto, joined Bologna in 1961 and oversaw a revolution. The Rossoblu had finished 10th in 1960-61, but Bernardini had a blueprint to bring Bologna back to Serie A’s forefront. The likes of Pascutti, midfielders Romano Fogli & Giacomo Bulgarelli and brick-wall defenders Pardie Tumburus and Mirko Pavinato formed the basis of a solid Rossoblu squad. Bernardini added libero Francesco Janich, West German international Helmut Haller and Danish hitman Harald Nielsen to the squad, and his vision was complete a few years later. Having finished fourth in both of the previous two seasons, Bologna approached the 1963-64 full of hope. An excellent start saw the Rossoblu go undefeated in their first six games, and they didn’t look back all season. Bologna lost just twice all season and claimed their first Serie A title since 1941 with the Dane, Nielsen, finishing as the league’s top scorer (21 goals). Many of the Scudetto-winning side became Bologna heroes. Pavinato, Janich, Fogli and Tumburus all made 200+ Rossoblu appearances, while Haller and Nielsen scored 48 in 179 and 81 in 157 respectively. Bulgarelli’s 486 games make him Bologna’s all-time appearance leader. Bologna’s seventh Scudetto was sadly their last to date. Bernardini left in 1965 and Bologna haven’t been able to replicate his league success since. They came close in 1966, finishing second to Helenio Herrera’s Grande Inter by just four points, and finished third the following season, slipping further downwards from thereon. It wasn’t all doom and gloom though, and the 1970’s saw Bologna win their only two Coppa Italias (in 1970 and ’74). If the 1970’s were mediocre, the 1980’s were disastrous. Spending much of the season battling with Cagliari, Genoa and Milan, Bologna were relegated to Serie B in 1982 after a last-day defeat at Ascoli. Perhaps the only bright spot of this season was Roberto Mancini’s emergence: the current Manchester City boss scored 9 goals in 30 Rossoblu appearances, and was transferred to Sampdoria as the season’s end. The decline continued in 1982-83. Bologna’s hopes of an immediate Serie A return proved far-fetched, and they struggled for consistency in an incredibly tight league. A remarkable eight points separate bottom (20th) from seventh on the season’s last day, and the Rossoblu’s 18th place finish saw them relegated for a second consecutive season. Faced with a terrifying slide into oblivion, the Rossoblu had to rally or face extinction in 1983-84. Playing in Serie C1 for the first time in history, Bologna’s fortunes improved. It was a three-horse race for two promotion places with Bologna, Parma and Vicenza battling it out. In the end, Bologna were promoted as runners-up, finishing just a point ahead of Vicenza and a single goal worse-off than champions Parma. Bologna became second-tier midtablers, finishing ninth, sixth and tenth in their first seasons back in Serie B. 1987-88 saw coach Gigi Maifredi arrive from Ospitaletto and another upturn in Bologna’s fortunes. Spearheaded by 21-goal man Lorenzo Marronaro, Maifredi’s Rossoblu were promoted as champions, and followed-up with safe 14th place Serie A finish in 1988-89. Finishing eighth in 1990 saw Bologna qualify for the UEFA Cup for the first time, but Maifredi didn’t stay to guide them through Europe and left for Juventus during the 1990-91 season. Brimming with the previous season’s possessiveness, Bologna tifosi had no idea of the troubles that would follow.